Due to its virtualization-based architecture, Qubes OS seemed to be the perfect OS in order to set up a pentesting lab that is a) easy to use and b) is separated from your daily-use VMs in a secure way. Additionally, with Qubes OS you can easily import VMs from vulnhub.com or any other sources for testing purposes. Within this article, we will discuss a step-by-step guidance on how to set this environment up. Preliminary conditions: Running Qubes OS (tested with Qubes OS 3.2), Internet connection, enough space on disk. We will set up a virtualized pentesting lab within an existing Qubes OS environment which will consist of a Kali Linux machine, a vulnerable server (pick one!) and a firewall used to separate the 2 machines from the rest of your Qubes installation and to enable networking between both VMs. You can basically follow the steps on Qubes-os.org for installing a Kali VM in your environment. Unless you changed the networking environment to DHCP, you need to manually assign the IP address to Kali – so check the assigned one in the Qubes VM Manager and assign it manually to the Kali VM via ifconfig. In Qubes, the sys-firewall VM is a core part of your compartmentalization concept and should be treated as a very sensitive machine. Therefore, you want to create an additional firewall VM which is only managing the compartmentalization within your pentesting lab. We call this firewall Pentesting-FW. On vulnhub.com you can find plenty of free, vulnerable server VMs available for download. Alternatively, you can install metasploitable which is available for download here. Now run the installer which is based on Ubuntu 14. It will automatically search via DHCP for a network configuration which will normally fail. Now, within the VM, configure the network appropriately and verify via ping that the connection to the Pentesting-FW actually works. 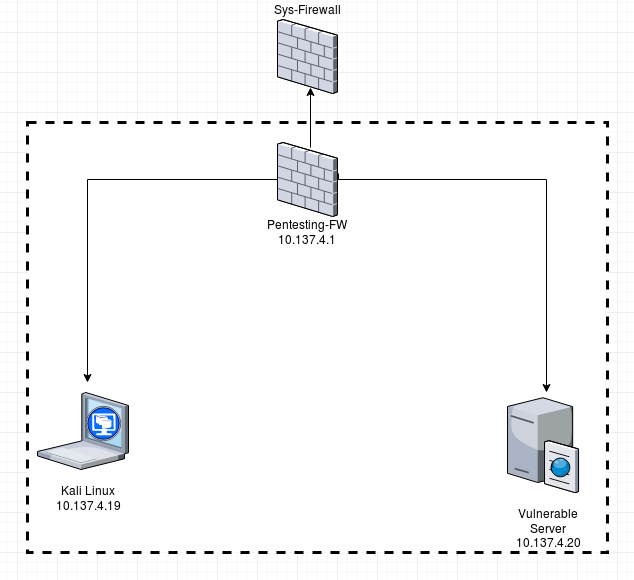 You will now be able to connect from your Kali VM to the vuln-server VM and the other way round. Keep in mind that this iptables rule does not survive a reboot of your VM – read more about how to fix this here. I can recommend the “old” article about playing with Qubes Networking from 2011 – most of the concepts are still valid in 2017.